Sometimes, my routes are chosen as a means to honour friends, fulfilling dreams that, for whatever reason, they have been unable to achieve themselves. 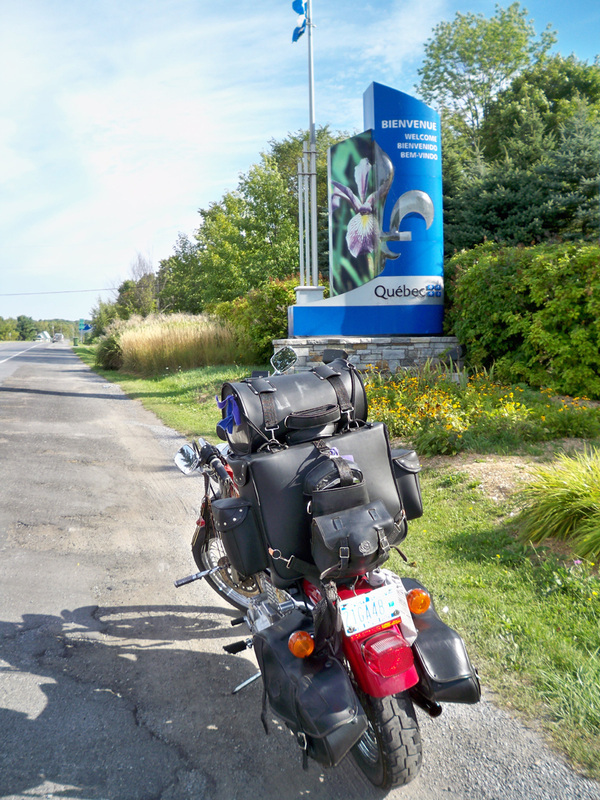 So it is with my decision to ride through Canada when I saw how close to the border I would be traveling on this trip. Homeland [in]Security has made our borders much more difficult to navigate in recent years. Within the past decade, even my cousin's military ID was insufficient when she attempted to visit Nova Scotia! This summer, a friend from Louisiana was prevented from accomplishing his dream to set foot in Canada for lack of proper papers. Passport in hand, "Rosie" and I stopped at the crossing on I-89. Explaining that I had simply decided to traverse the Canadian side of the St. Lawrence on my way to Ogdensburg NY, and recording "Rosie's" tag number was all that was needed to obtain a smile and blessing for an enjoyable trip. 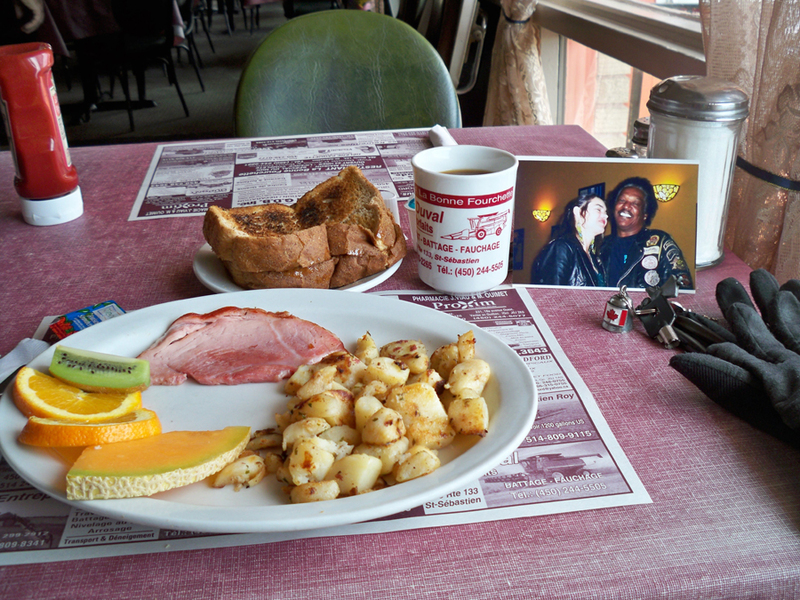 Food was first on my agenda, also providing an opportunity to "have breakfast in Canada with my friend", at least in spirit. Choosing the assiette dejeuner of meat, potatoes, and fruit, I utilized the little French in my vocabulary. For a cheque of $5 Canadian, I was told $9.56 American, with an exchange rate of 5%? Initially angry as I put the coins in my pocket, taking the perspective of buying my friend breakfast calmed me. Perhaps, it was a test of American arrogance, or a sample of Canadian humour. My experiences have shown me foreign coinage is usually difficult for most people to manage. Examining the coins in my pocket, I found I had only been charged $5.56! Still a bit high, but acceptable given the tip that would have otherwise been left. A stop for informacion in St. Jean sur Richelieu took me four km from the highway, down sidestreets. What did it matter if the directions were all in French, so were the road signs! The hardest part was judging speed. Shortly after entering Canada posted speed limits read 90 kph = 55 mph. Further in, quick mental conversions based on that fact were necessary. Ow! "Damn that hurt!" I thought, as my right eye teared from the impact at the corner of my nose. Had the car ahead of me kicked up a stone from the construction we were traveling through? Then I felt the fire begin to spread through my cheek, and I knew ... I had hit a bee. "That wasn't nice, Creator" I chided. Apologizing immediately after, "Ok. I am grateful it didn't hit me in the eye!" There was heavy traffic traveling through Montreal, Quebec on Autoroute 35, with no shoulder. The sooner I could pull over and take some of the Benedryl in my pack, the more the reaction would be minimized. Moving onto Autoroute 10, the only exits are onto other highways leading ... where? By this time the pain had spread to include the other side of my nose, my top teeth, and my entire upper palette. Worse still, my heart was fluttering violently and I was coughing, nearly to the point of retching! Was I having a heart attack? Even just losing my equilibrium and going down would mean death in that traffic! With all the risks of the road, an insect taking me out had never crossed my mind! Finally, on Autoroute 20, there was an exit into a residential area with easy re-entry onto the highway. Somewhere, the Benedryl had fallen out of my first aid kit. Dry swallowing an Advil to at least lessen the pain, I sat on the sidewalk until my body felt more steady again. Getting stung at 60 mph hyper-injects the venom, this time into my sinuses, a nearly direct hit, via my lungs, to my bloodstream. It is the most frightened I've been on a bike in many, many years!